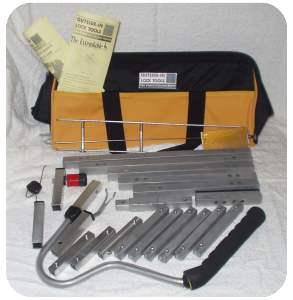 As one of the newer producers of tools for Locksmiths, Outside-In Lock Tools commenced initial production around April 2011, almost by accident. It all started after a particularly troublesome lockout which involved the turning of an extremely tight key, through the letterbox. Ipswich Locksmith Simon Barber, was determined to make situations of this nature a thing of the past. Once back in the workshop, Simon put together what was to become the very first ‘SideWinder®’, an add-on for the standard Letterbox Tool, which made turning keys, thumb turns and night latch knobs quick and easy, by using a unique Registered Design ‘Direct Drive’ mechanism he had designed. Simon took the ‘SideWinder’ prototype along to the next meeting at Island Locks, where he was encouraged by Jay who ran the meetings, to refine and market the new tool. A demonstration was kindly arranged by Jay for the next meeting, and around twenty-five of the new ‘SideWinders’ fabricated. The demonstration was met with great enthusiasm by the ‘Islanders’, with all tools selling out on the day. With word spreading amongst Locksmiths about the efficiency of the ‘SideWinder’, and with sales increasing and encouragement from Suzzie Belcher, out of the blue Simon received a call from one of the largest Locksmiths wholesalers, saying that they had received a number of requests for the ‘SideWinder’, and because of its reputation, they wanted to supply any tools that Simon was producing. When a problem was encountered on a lockout, a new tool was developed. These included the ‘BullsEye’ designed to help open BS Night latches, and the fastest-selling snapper bar, the ‘Rod-Based Snapper’. At a subsequent meeting, the topic of security-plates for letterboxes, and the near-impossibility of using the standard letterbox tool on them was raised. This suggested another tool could be advantageous, and with Simon’s partner Wendy now on board, who has a background in prototyping, ‘The Rattler®’ was born. Together, Wendy and Simon looked at ‘problem situations’ for Locksmiths, and came up with solutions that solved these problems in new and innovative ways. ‘The Rattler’ was a replacement handle for the letterbox tool, which effectively bypassed security-plates and high-security letterboxes, utilising its Registered Design ‘loop’. After prototyping, and extensive testing in the field, ‘The Rattler’ was officially launched, selling out the initial run swiftly, and is now the handle of choice for many Warrant Locksmiths because it is the only handle capable of bypassing high-security letterboxes. As Outside-In Lock Tools stepped up production and expanded, other projects were to follow, which required the installation of a variety of high-end, professional engineering machines. The decision to design a brand new Letterbox Tool was not taken lightly, but it was apparent that a new tool could be stronger, easier to use, and more efficient when up against today’s locks and door security. Wendy had come up with the design and concept for what was to become the ‘Extreme Letterbox Tool Kit’, – designed from the ground up to be the most advanced LBT on the market, and including unique features such as the ‘SureLock’ system which positively locks LBT together sections, using metal connectors with virtually no flex, that allow for both a pulling and pushing movement, without separating. Sections may also be extended in situ, and once the included attachments are used, allow for far greater LBT bypasses than ever before, including bypassing non-deadlocked Ingersoll SC71s, even when letterbox security-plates are used, which is another first. Release of door-chains and pulling door bolts can also be accomplished in seconds. Although Simon’s Locksmithing work has currently taken second-place to tool design and production, he is keen to keep his hand in, and keep up with new developments. He feels very strongly that it is important that Locksmiths tool designers are Locksmiths themselves, in order that the tools actually work. Reputation is paramount to Outside-In Lock Tools, as the majority of tools are sold by their reputation. Their motto is “The Future is in Your Hands”, and with this in mind it will be interesting to see what new developments the next twelve months bring. The Visi-clamp is a great idea. Are these sold separately? Yes the visi clamp is available to buy separately. Hi, yes it can be bought separately, its at the bottom of the accessories page on our web site. Simons tool will pay for itself in the first couple of jobs. Faaaar better than some of the other letterbox tools i see for sale.